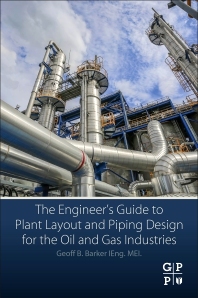 The Engineer’s Guide to Plant Layout and Piping Design for the Oil and Gas Industries gives pipeline engineers and plant managers a critical real-world reference to design, manage, and implement safe and effective plants and piping systems for today’s operations. This book fills a training void with complete and practical understanding of the requirements and procedures for producing a safe, economical, operable and maintainable process facility. Easy to understand for the novice, this guide includes critical standards, newer designs, practical checklists and rules of thumb. Due to a lack of structured training in academic and technical institutions, engineers and pipe designers today may understand various computer software programs but lack the fundamental understanding and implementation of how to lay out process plants and run piping correctly in the oil and gas industry. Starting with basic terms, codes and basis for selection, the book focuses on each piece of equipment, such as pumps, towers, underground piping, pipe sizes and supports, then goes on to cover piping stress analysis and the daily needed calculations to use on the job. Geoff Barker is a Professional Engineer and Principal Consultant at Independent Oil and Gas Consultants in the USA and United KIngdom. He received his Higher National Certificate in Mechanical Engineering from Leeds Polytechnic Institute in the United Kingdom. He also studied at the George Brown College of Applied Arts and Technology in Toronto, Canada, where he received qualifications in Process Plant Piping Design and Calculation. Continuing his education, he studied Natural Gas Processing and Gas Plant Operations at The Southern Alberta Institute of Technology in Canada. Geoff also received accreditation from ASME in ASME B31.3 Process Piping Design, ASME BPV Code, Section V111, Division 1, and API 579-1/ASME FFS-1 Fitness for Service. He has more than 40 years of industrial and consultancy experience in the oil and gas onshore and offshore industries, as well as petrochemical, mining, pharmaceutical and food processing industries. Geoff has held engineering, supervisory and management positions at various companies including Fluor BV, CBI, MW Kellogg, Brown and Root, Bechel, Technip, Kvaerner, Aker Engineering, Shell, Exxon, and Wood Group. He has served as a consultant to numerous EPC, engineering and industrial companies as well as professional organizations worldwide. Geoff is a member of the American Society of Mechanical Engineers, The Energy Institute (UK and USA), and a former member of The Institution of Plant Engineers (UK), The Society of Operations Engineers (UK), and The Institute of Mechanical Incorporated Engineers (The Institute of Engineering Technology-UK). Informativery book with lots of figures and illustrations.